It’s pretty easy to have a good spiritual focus for Thanksgiving, but when it leads straight into the materialistic frenzy of Christmas prep, there’s potential for our messages to get mixed. Don’t get me wrong: I love Christmas decorations, the smell of a fresh Christmas tree, and the thrill of giving and receiving gifts. 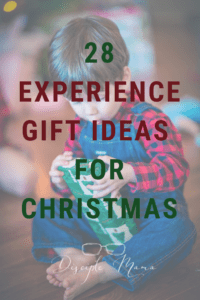 I think there’s room for that at Christmastime, but it’s important for us as Christian parents to help our kids keep focus firmly on Jesus and family togetherness–that’s why I’ve put together this list of experience gift ideas. Experience gifts can help bring balance to gift giving. You still have that element of surprise, but it adds an emphasis on quality time. If you’re anything like me, you probably set out each year with good intentions to get your shopping done early. But, if you’re anything like me, you also probably still find yourself frantically shopping online down to the wire and depending on Amazon Prime to come through with that free 2-day shipping. This year, as much as possible, I’m trying to plan ahead by really thinking about each person I’m buying for, and asking myself 3 questions to determine whether a gift is worth my time, effort, and/or money to give. Of course, for any gift to work, there are a lot of variables at play: How well do you know the recipient? How close or far away do they live? What are their interests? How much do you have/want to spend? Before you read any further, let me remind you that some of the links on this page are affiliate links, which means I may receive a small commission if you click through and make a purchase. I only post affiliate links to products that I have used and actually recommend. I’m a stay-at-home (sometimes work-part-time-at-home) mom, married to a pastor. I don’t have thousands to spend on fabulously amazing gifts, so every dollar needs to count. Yes, I value my family and friends more than money, and I feel they’re worth the spending, but as a Christian mom, I have a strong responsibility to teach my kids that our money is God’s. To me, financial stewardship in gift giving means spending thoughtfully within my means and choosing gifts that will be of maximum value to their recipients. Is it something the recipient can enjoy with me (or someone else important to them)? Is it something that I’m confident will add value to the receiver’s life? Does it work for my budget? Questions 1 and 2 work pretty well to weed out ideas that will just add stuff to someone’s collection. They also help pull focus away from the commercialization of gifting and back onto elements of celebration that are more inline with a Christian worldview. More and more often, I’m coming to the conclusion that an experience gift is the best choice, no matter who will be receiving it. Material gifts are fine (and can be great! ), but they should be meaningful and hopefully still lead to some kind of shared experience, if they are to add value. Gifting things that people actually need can work, too. Question 3 is just there to keep spending in check. I’m usually pretty thrifty, but I have a tendency to go overboard for the holidays. I would encourage you to ask yourself these 3 questions the next time you need to give a gift, and see if it helps you to choose something you’re really excited about giving. I think if everyone did this, there would be many more experience gifts given, and many fewer knickknacks and tchotchkes collecting dust. For quite awhile now, research has been telling us that spending money on experiences makes people happier than spending money on material things. In 2013, the Journal of Personality and Social Psychology published an article that concluded that it’s not the experiences themselves that make us happier, it’s the social aspect of these types of purchases that make us feel good. (source) So, what’s the takeaway for gift-givers? Whatever gift you give, to make the most of it, you’ve got to give your time and attention along with it. That means that if you plan and give an experience gift, it will bring the most happiness to the recipient (young or not-so-young) if you are present physically and emotionally. Put your phone down, listen, share, and really focus on building memories. If you give a material gift, make it something the recipient can use with you! If you’re giving from a long distance, make it something you know they will have plenty of opportunities to use with a friend or family member. In the eyes of the receiver, the social element of the gift is more important than the money you spend on it. 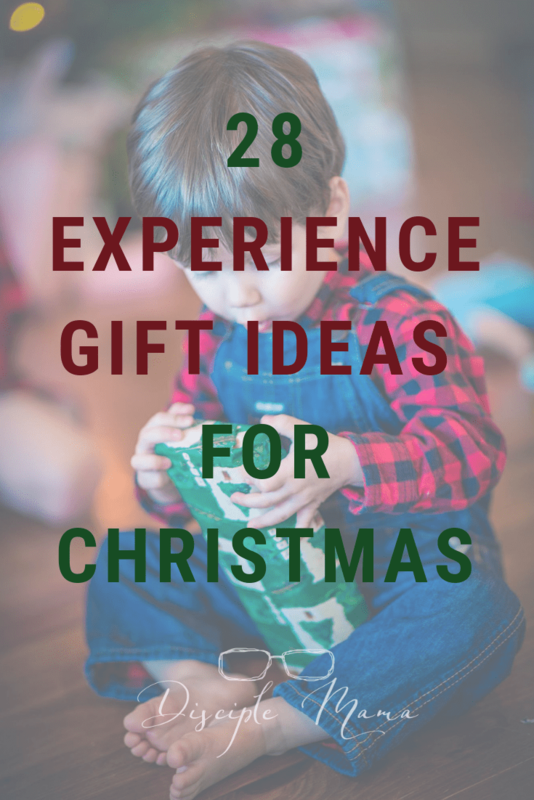 Use the following experience gift ideas or be inspired by the list and come up with your own! Make your gifts as personal as you can, and I promise you’ll feel great about every penny/minute/iota of energy you spend. You guys, as a mom, I am all about experience gifts for my kids. I am absolutely in over my head (almost literally) with all of the toys my kids have. Don’t get me wrong, most of our toys are awesome (and the right toys are great learning tools), but I’m not the only mama who just can’t keep up with the mess. Enter these experience gift ideas for kids. Awesome experiences that toddlers on up will LOVE. Screen-free fun for better quality time with their loved ones. No mess for overwhelmed mamas (or dads) to clean up. Memories that will last forever. concert– my son LOVES music, and thinks it’s so much fun to dress up and go to a special concert. Music + quality time with you = a great Christmas gift. cooking/baking– spend an afternoon whipping something up in the kitchen together. Decorate sugar cookies, make the child’s favorite meal, whatever sounds delicious! The mess you make will clean up in a few minutes, but the memories you create will last a lifetime. Not really a baker yourself? Use a mix, and you’ll still have plenty of fun! “date” day– plan a date! You can plan the whole day/morning/afternoon yourself, or you can wait and let your child/grandchild plan it with you. Either way, focus on activities you both love, with opportunities for good conversation and quality time. music lessons– know a music lover? Give lessons! For very young children you could find a Kindermusik (or other comparable) class, and for older children, you might sponsor a few months of instrument or voice lessons! camping trip– camping can be a bit tricky at Christmastime, if you live in snowy climes like we do. But, if you just can’t wait until spring, you can set up a tent in the living room and do a practice run. gymnastics lessons– we haven’t tried gymnastics lessons with our kids, but my friends who do it have only good things to say about how it teaches their kids gross motor skills and discipline. mini golf– my 2.5 year old only actually played about half of a round of miniature golf when we tried it for the first time, but he loved the whole 18 hole experience. Choose a place with an interesting theme, and it’ll be a great time for everyone, regardless of how well anyone plays! farm visit– plan a day centered around a visit to a local farm or petting zoo. Your animal loving kiddos will love it, and it’s a great way to spend time learning more about God’s creation! dinner out– even though E can only actually eat the food at a very small handful of restaurants (he’s got food allergies), he loves going out to eat. You can dress up (if your child is into that) and make a big deal of dinner. Just make sure you put your phone aside (except to get a fabulous selfie of you and your dinner partner) and really spend some quality time together. boat or train ride– I haven’t met too many kids that weren’t excited about one or the other, have you? Experience gifts are often more of an investment than material gifts, and if your resources are limited (whose aren’t?! ), it might fit your budget better to buy a gift that will benefit the whole family rather than individual gifts for each person. If you’re on the lookout for quality experience gift ideas that work for the whole family, this is the list for you. Be inspired. You’re welcome. 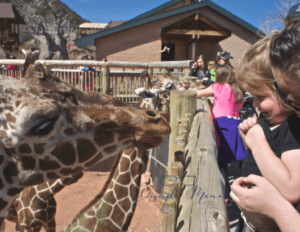 zoo membership – my parents gifted us a membership to our local zoo, and we have been loving it! AZA member zoo memberships offer reciprocal benefits, so we’ve also gotten into other zoos around the country at a 50% discount, or even for FREE! And, as parents of very young kids, it’s freeing to know that you can leave the zoo to get home for naptime without feeling like you haven’t gotten your money’s worth…we can just go back again soon and catch what we missed the last time! aquarium membership– Even my (then) 11 month old was fascinated by the tanks at the aquarium when we visited this summer. If you are buying for a family lucky enough to have an aquarium nearby, this would be a great gift! pool membership– because, um, what kids don’t love the pool? Family fun and great exercise all in one…this one is a winner! And, bonus idea: swim lessons are great gifts for kids, too. parks pass– Depending on where you live, this could mean a National Parks Pass (they’re FREE for families with a 4th grader! ), a state parks pass (our Michigan Recreation Passport is just $11 per year with our vehicle registration), or even a county or municipal parks pass (we get a Berrien County Parks annual entrance permit every year, and it’s worth it!). books– reading together is a great way to spend quality time with kids, and kids that read and have someone read to them regularly are at a huge advantage in so many areas of life. We love Little Blue Truck ,all of the Otis books , and, if you’re looking for a really cute little Christmas book, Who is Coming to Our House? is a favorite over here. seeds– watching a plant grow from a seed is an amazing experience, and you’ll have so much fun working with your child to help it grow. It’s super fun science, guys! puzzle– puzzles are fantastic learning tools. Give a child a puzzle that’s just a tiny bit more difficult than they’re used to, and work on it with them. You’ll have plenty of time to talk, and *bonus* you can both sharpen your spatial reasoning skills while you’re at it! devotional/Bible story book– the family worship experience is one of the most important parts of the day (read here to find out why you should be having family worship). So, give the gift of a new book to read during your family devotions! Our favorites are The Jesus Storybook Bible and the My Bible Friends series. tools/toolbox– my husband made my son a cute little toolbox for his birthday (which hasn’t happened yet, so shhh!!!) and has filled it with tiny wrenches and other relatively safe tools. My son gets a huge kick out of “helping” his dad fix things around the house, and I’m pretty sure he’s going to be over the moon about his new tools. This gift requires supervision, and only works if you’re willing to have a helper who will likely slow you down (but will love every minute of working with you). Have you tried in vain to find a gift for a mom or dad who has everything? 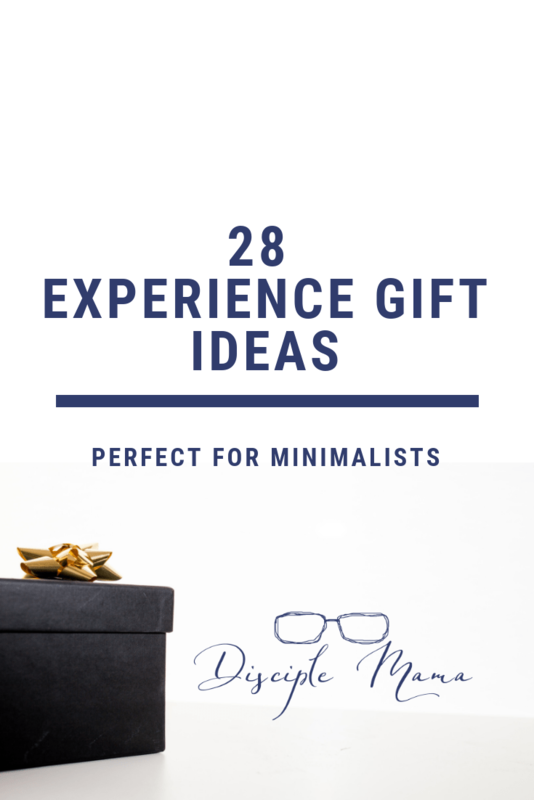 Or maybe your friend is a minimalist and you know that if that scarf you chose doesn’t give her that life-changing magical feeling, it’s going right back out that door. It’s too much pressure, you guys. 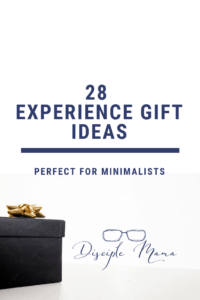 Well, look no further, because these experience gift ideas require no decluttering and will be sure to bring joy to any parents (minimalist or otherwise). babysitting– Even the parents who have everything they want need some time away once in awhile. Offer to babysit and give them an evening out! NOTE: if you haven’t looked after the kids before, you may not want to give this gift. Parents may have a tough time turning their children over to anyone (even just for a few hours), so if you’re not sure they want to give you the kids, you might want to avoid a potentially awkward situation. escape room tickets– Escape rooms are all the rage, and what a fun way for a couple to spend time together! a couples class– No, not Pathophysiology or Statistics (but good for you if those float your boat!). Why not treat parents to a fun, one-time class on an interest they share–vegetarian cooking, nature photography, or calligraphy. (Need an example? Here in southwest Michigan the Downtown Market in Grand Rapids has all kinds of offerings: check out this Beginner Sushi class!) NOTE: This probably isn’t the time to teach one parent to love the other parent’s favorite pastime. Choose something you know they both already enjoy. date night in box– If you can’t watch the kids and send their parents out, you can send them a date night in! These boxes, which include everything you need for a date night at home, even have a faith option to add more depth to the date night conversation. family photo shoot– grandparents love family photos (I mean, really who wouldn’t? Your family is adorable, right?!) so give the people what they want! Arrange for family photos (on a day when as much of the family as possible is together) and make sure you get photos of the grands with the kiddos, because those will be priceless. NOTE: You have to order at least a few prints for the grandparents, you guys. This is nonnegotiable. heirloom day– plan a special day for grandparents to pass on a special skill or story to their grandkids. Grandparents love to be asked to share of themselves, and kids can learn so much from them! Grandparents can be asked to teach their grandkids: a favorite game, how to cook a favorite meal, a special story from their own childhood, how to knit or build a bookcase, etc. The ideas are endless, and both the grandparents and grandkids will have a blast teaching and learning from one another. I just subscribed to Disciple Mama and I’m very excited about it. This is excellent material! I love experience gifting. Once upon a time my husband and I used to dread buying Christmas gifts for my nephews. We never knew what to get because they had enough things already. Then to watch the item get pushed aside or even broken within a few months, made us wonder, “Why did we bother? “. So, we started giving them experience gifts. First we started with a sleep over and mini golfing, then a trip to the Aquarium, then over the years we ended up taking a yearly trip to a National Park. These memories will last a lifetime! Now, we do it with our own kids. We just took a trip to The Ark Encounter last month. Trips can get a little spendy, too. So, we say is both a birthday and a Christmas gift in one. We have the luxury to do that because they have plenty presents open from several family members. As far as giving them something to open, we have always enjoyed getting a little creative in surprising them with the new destination. We’ve made tickets, a puzzle, and we’ve bought a little book to give a hint. It’s been great, and the kids just love it! Thank you for all your great ideas! I plan to use some. Just one question… You said that Escape Rooms are all the rage. Just what is an Escape Room? Sounds like something I would be interested in. Ashley, yay! Thank you for subscribing! I’m excited too! Thanks so much for sharing about how you’ve been experience gifting. 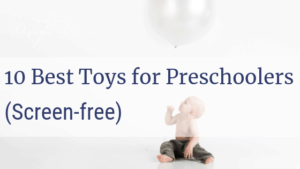 It’s wonderful for my kids to have toys to play with (and they have plenty), but it gets overwhelming, and like you mentioned, they get broken or the kids lose in interest in all but their favorite few. I love the idea of finding creative ways to “unveil” the experience gifts! That’s so great! I’m sure they really look forward to all of it! Escape rooms have been around for awhile, but I hadn’t heard anything about them for YEARS until probably 2 years ago when they started popping up all over the place. They’re basically rooms decorated for a certain theme, with a series of puzzles you have to work together with your “team” to solve and escape the room before time is up. You can get a full group together, sign up with other small groups to fill the room, or get tickets for just a couple or your family. It just depends on the place. There’s one in Mishawaka, and there’s one between here and St. Joseph (but I haven’t been to either of them). I went to one in Boston with friends back in my single days…it was really fun! Nice! Thank you for explaining what escape rooms are for me. Now, I remember my younger sister telling me about them. Sounds like fun! These are such great ideas and some of them I had never thought of! We received a zoo membership from my son’s grandparents and we love it, use it all the time! Yes! It’s so nice to have a place to go whenever we want, and without the pressure of having to do the whole.thing.every.time. if we don’t want to. Let’s be honest, sometimes nap time is more important than seeing the lemurs, but you want to get your money’s worth! The membership solves that problem, and I love it. Yay, Joan, I’m so glad! I am sure that whomever you’re shopping for will love what you choose! Let me know if I can be of anymore help, and I hope you visit the blog again soon! The older I get, the more I realize how much more precious a gift if time is over material things. Great ideas. Carly, it’s true. Age really does bring some perspective in this area! Time is something we can never replace, so we should make the very most of it. I’m glad you enjoyed these ideas! Thanks for visiting my blog today! What great ideas! The older I get the more I appreciate gifts that create memories not clutter! Hi Michelle, it’s funny how age does that, isn’t it? Thanks for visiting my site today! When I realize how much “stuff” has been accumulated in our grandchildren’s few short years – the experience gifts look more and more appealing. These are wonderful suggestions to start with. There’s too much stuff in my house! 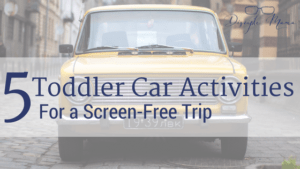 Even the really great stuff can be overwhelming with small children, so I love things that help us bond without all that mess! Thanks for visiting my blog today, Beth! Thanks for sharing; it’s always a good plan to plan ahead. Life is much easier when we do that. Those are three good questions for the decision-making process related to buying gifts. Your concept about experience gifts is interesting – I like your take on that. Hi Edna, a family photoshoot is always appreciated (even if not while the pictures are being taken), because the memories are so long-lasting! Thank you for visiting my blog again today! This is a great list Brianna, it reminded me of a gift for my sister-in-law, which is a gift card to a local movie theatre. In the past, we’ve received one of the coolest gifts for the kids. It was a combo package of movie tickets, putt-putt golf tickets and a gift certificate to the local arcade. This was my first introduction to experience gifts. We loved it. We definitely need to give these types of gifts more often. That combo ticket sounds like so much fun! Growing up my family loved to go miniature golfing and we still try to do it when we can! What a fun way to spend time as a family. Thanks for your comment, and thanks for visiting my blog again, Wendy! Thanks Brianna for the great ideas! I remember that one year my brother and his wife took my daughter to the Sights and Sound Theatre to see Noah. This was about 5 years ago and to this day she says it is one of the best gifts she has ever gotten. Part of the gift was getting to experience the musical with her cousins. There IS something about experiences that help build memories that last a lifetime. I am a little bit of a Christmas procrastinator so I once I sitt down and start thinking about gifts, I will have to review your list for ideas. I will be pinning it to my Pinterest board for future reference. I’ve heard that the Sight and Sound Theatre is a good one, but I’ve never been! How great that she has such a fabulous memory of it! I still remember when my aunt took me to see a ballet when I was little, it was so exciting and such a special treat to spend time with her like that. I totally understand about the procrastination, too. I am not always on top of my Christmas shopping! Thanks for pinning my post, and thank you for visiting my site again today, Luisa! Brianna, what an awesome post! You offered countless fun and meaningful family ideas that are thoughtful for everyone at every age! I’m a big fan of experience gifts myself, as I get very tired of cleaning up clutter. We have enjoyed many of the ideas from your list, but you gave me some new ones to plan for in the future, like the heirloom day. I also appreciate how much thought you put into the strategy stages, by asking some basic questions about what you are buying, for whom and what is the final outcome of this gift. By being intentional about the gifts, I’m even putting more love into it from the start. Thank you for all your wonderful ideas! Melissa, I’m so glad you enjoyed this post! We all know that “it’s the thought that counts” in gift giving, so intentionality is at least half the battle! Thanks for your kind feedback, and I hope that your gift giving goes smoothly and is fulfilling this holiday season! What a fabulous post! Our boys are teenagers now, but they definitely enjoyed places like the aquarium and the zoo. We still sometimes visit the zoo in our city (which, by the way, is in your photo), and we enjoy it. I love that you also included gift ideas for parents and for grandparents. You gave me a great idea for a gift fo my parents. I’m so glad you enjoyed this post, Jeanne! The zoo in my photo is such a fabulous one! I haven’t had a chance to take my kids there, but spent time with my niece there when she was very little and loved it! 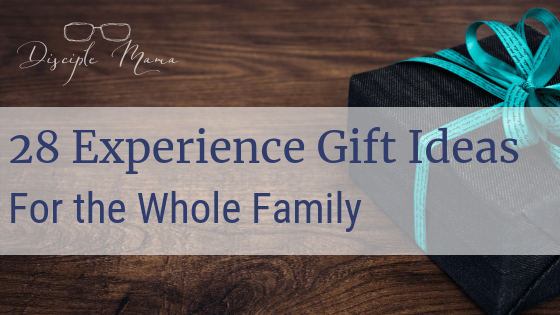 I am so glad to hear that you were inspired to choose a gift for your parents from this post! That’s the goal! Thanks for visiting my blog again! Thanks for visiting, Lauren! I hope you found something that would work for the difficult to buy for person on your list! Please visit again soon! Laura, thanks for visiting my site! I’m so glad you enjoyed the post on experience gifts. I’m always excited to hear about how other people do this, so thank you for sharing how you gift experiences to your nieces and nephews! I’m sure they love their special time with you, and I’m sure their parents love it, too! It’s super thoughtful to keep everything open ended so as to work it out with the school schedules, too. I’m going to check out those gift certificates. By the way, I visited your website today, and it’s beautiful! These are all such wonderful ideas! I’m keeping this list handy for future use. My 17-year-old son actually came up with the idea of giving an “experience” gift to my husband for Christmas, so we bought family tickets to see a Comedy Sports show (family-rated, no crude language, etc.). We then told my husband he could pick a place to eat. We just “used” the gift over this past weekend, had a delicious meal at a Brazilian restaurant and then enjoyed the comedy show. We also left cell phones at home for the evening. Both the dining and the entertainment were new experiences for my boys, and I loved watching their fascination and amazement through it all. I’m definitely going to consider “experience” gifts the way to go for future birthdays and Christmas presents and will use ideas in your post as I go. Thank you!